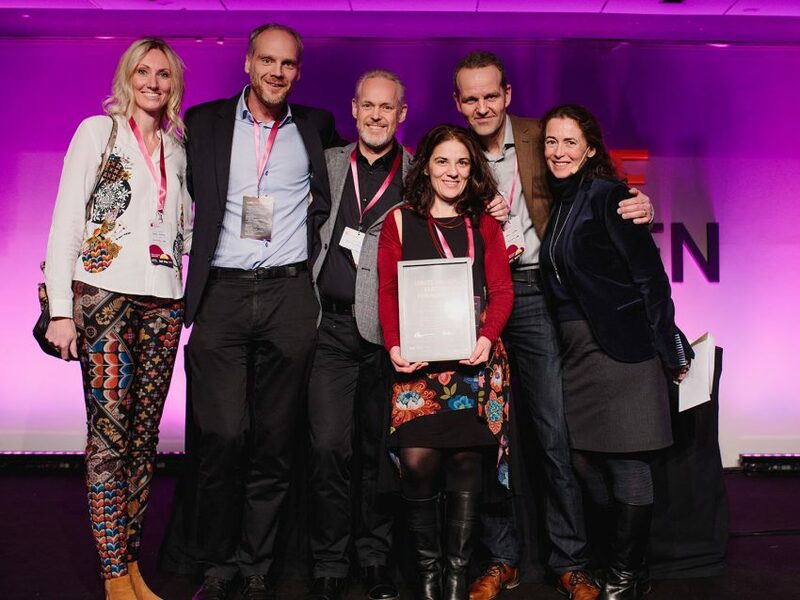 The team from SynerLeap was awarded for their work with Swedish startups. From the left: Camilla Kullborg, Head of Robotics & Automation, Peter Löfgren, Managing Director, Rolf Lindström, Communications Manager, Gaetana Sapienza, Head of Operations, Martin Olausson, Head of Business Development and Marie Wall, Deputy Director Startups at Ministry of Enterprise. Photo: Elias Ljungberg. During Ignite Sweden Day on November 16 at The Brewery Conference Centre in Stockholm, ABB's SynerLeap received the award "Ignite Sweden Startup Engagement" for teaming up with the most startups in 2017. Taking on an increasing role in the startup community and investing in finding applicable models to enable startup collaboration, this industry giant [ABB] has met 68 startups through Ignite Sweden this year. By involving a number of different business units in the meetings, ABB’s growth hub Synerleap has enabled startups to build a strong network within a global organization; an important key in identifying real business opportunities. SynerLeap represents one of a number of important links between the startup community and ABB. ABB Technology Ventures (ATV), ABB’s strategic venture capital investment unit, partners actively with SynerLeap to see over 2,000 startup ideas every year and, since 2010, has invested over $175 million into companies of strategic relevance to ABB. Together with SynerLeap, ATV is ensuring that startups at all stages have a clear entry point into ABB as well as proactive advocates working to maximize their success. “SynerLeap has invested resources from various business units to meet startups during Ignite. This is an important key for the project – early B2B startups need feedback from industry experts to validate their business idea, while later stage startups need to find real business cases for their first pilot. Access to the right persons from the corporate side is crucial in enabling this. ABB’s engagement in this is much appreciated from the project owners, but foremost from the startups who have met them during this year,“ says Stina Lantz, project manager Ignite Sweden. Also published as a press release from ABB, in Swedish. Ignite Sweden is a project aimed at creating more commercial partnerships between large companies and small innovative startups. The project began at the start of 2017 and has matched 37 major companies with over 140 tech startups from all over Sweden in over 600 meetings. An important part of the project is to exchange experiences about the challenges of collaboration between large companies and startups. Behind Ignite Sweden are the incubators STING, LEAD and the startup hub THINGS. The project is run in collaboration with Swedish Incubators and Science Parks and is funded by Vinnova. SynerLeap, is a growth hub started by ABB in September 2016. It gives ABB access to innovative technology and growth-driven entrepreneurs while the SynerLeap startup companies are given the chance to get acquainted with ABB’s networks, laboratories and knowledge. It creates an ecosystem where small technology companies can grow and expand on a global market in three areas: industry automation, robotics and energy. Today, there are 19 companies in SynerLeap. ABB (ABBN: SIX Swiss Ex) is a pioneering technology leader in electrification products, robotics and motion, industrial automation and power grids, serving customers in utilities, industry and transport & infrastructure globally. Continuing more than a 125-year history of innovation, ABB today is writing the future of industrial digitalization and driving the Energy and Fourth Industrial Revolutions. ABB operates in more than 100 countries with about 136,000 employees.